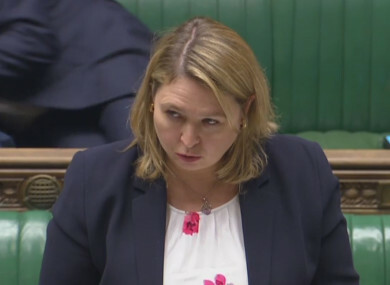 British minister Karen Bradley gave a House of Commons statement; while earlier a fifth man was arrested in connection with the attack. NORTHERN IRELAND SECRETARY Karen Bradley has repeated criticism for a car bomb that went off in Derry over the weekend, and said that it has “absolutely nothing” to do with Brexit. Her statement comes hours after British Prime Minister Theresa May condemned the attack, and after a fifth man was arrested in connection with the incident. The explosion occurred outside the courthouse on Bishop Street in the city, shortly after 8pm. British minister Bradley told the House of Commons that “nobody should try and draw any connection between what happened on Saturday night and negotiations with our friends in Europe”. The attack that happened on Saturday night is the result of a threat level that has been in place before the Brexit vote, these are plots and activities that these people have been working on and trying to carry out for many many years. “This has absolutely nothing to do with Brexit or anything close to it,” she concluded. Bradley said that those behind the attacks had “no regard” for the people who live and work in Derry. She said that CCTV showed teenagers and others passing by the car just minutes before it was detonated. “A fundraising event was taking place, and elderly residents were in sheltered accommodation all within yards of the incident,” she said. She said that the wider community have condemned the attacks and added that the city “remains open for business”. Those behind the attack will never succeed… this is intolerable violence that cannot be accepted. [The people behind the attacks] have absolutely nothing to offer Northern Ireland and will not prevail. She paid tribute to the police who responded to the incident, and said that May’s government had committed €160 million to counter-terrorism measures in Northern Ireland. Four men, aged 42, 34 and two aged 21 arrested yesterday by detectives investigating the explosion at Bishop Street in Derry have been released unconditionally. A 50-year-old man arrested earlier today remains in custody under the Terrorism Act. The suspect is also being questioned about an armed robbery in the Meadowbank Avenue area of the city on Tuesday, 15 January. The PSNI has released footage of the moment the car exploded outside the courthouse. Taoiseach Leo Varadkar described the attack as an “appalling, reckless and cynical act of terror”. Anyone with information about the incident has been asked to contact PSNI on 101. Alternatively, people can contact Crimestoppers anonymously on 0800 555 111. Email “Derry car bomb has 'absolutely nothing to do with Brexit', Bradley says”. Feedback on “Derry car bomb has 'absolutely nothing to do with Brexit', Bradley says”.